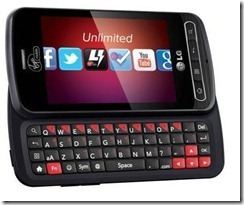 Today Virgin Mobile announced two devices, the HTC Wildfire S, and the LG Optimus Slider. The first phone was the HTC Wildfire S and it’s nothing special and it’s the exact phone announced back in February. This one will hit the market on October 23rd and will be available at Best Buy, and Radio Shack. The second phone is the LG Optimus Slider, is the second generation LG Optimus V. The phone will be available on October 17th (online only), and October 31st in Best Buy and RadioShack stores and November 6th at Target and November 13th in Sprint stores. Now these phones aren’t powerhouses but they’re perfect for the low end users. WARREN, N.J. (BUSINESS WIRE), September 30, 2011 – Virgin Mobile USA expands its Android™-powered smartphone lineup with the upcoming availability of LG® Optimus™ Slider, providing a new smartphone option with an easy-to-use slide out keyboard. Perfect for the heavy social networker, LG Optimus Slider will be available Oct. 17 at www.virginmobileusa.com for $199.99. The smartphone will be available Oct. 31 in Best Buy and RadioShack stores; Nov. 6 at Target; and Nov. 13 in Sprint Stores. LG Optimus Slider is the second generation of the popular LG Optimus V™, which launched in early 2011 and is currently available at www.virginmobileusa.com for $149.99. It remains one of the most popular smartphones on Virgin Mobile USA. "With the new LG Optimus Slider we’re bringing our customers an updated operating system and slide-out keyboard," said Mark Lederman, Business Line director, Virgin Mobile USA. "According to NPD Group, year-over-year preference for a touchscreen has tripled among prepaid buyers, and 21 percent1 of all customers say that having a QWERTY keyboard is a motivating factor in making a purchase. Coupled with the popularity we’ve seen on the LG Optimus V we’re looking forward to bringing this fresh option to Virgin Mobile." "LG Optimus Slider delivers the convenience of a full QWERTY keyboard with the sleek lines of the LG Optimus series," said Tim O’Brien, vice president of marketing for LG Mobile. "We look forward to providing Virgin Mobile USA consumers the ideal device for on-the-go messaging, emailing and social networking." Virgin Mobile USA Beyond Talk plans start at just $35 a month for 300 minutes of voice and include unlimited messaging and data. For those looking for a bit more talk time the $45 plan offers 1,200 minutes of voice, and the $55 plan offers unlimited voice minutes each month. All plans include unlimited messaging and data. LG Optimus Slider comes preloaded with Virgin Mobile Live 2.0 social networking lifestyle application used to access the Virgin Mobile branded music stream, hosted by DJ Abbey Braden. The app also provides users of Android-powered devices free access to live music performance videos and “check in” features at special events. All status updates made using the app will also sync with Facebook® and Twitter®. The previously announced decision to reduce throughput speeds when any Beyond Talk customer reaches 2.5GB of data usage within a current monthly cycle has been postponed to 2012. Virgin Mobile USA, one of Sprint‘s prepaid brands, offers millions of customers control, flexibility and connectivity through Virgin Mobile’s Beyond Talk™ No Contract plans with unlimited data for mobile phone service including Android-powered smartphones and prepaid Broadband2Go high-speed Web access. Virgin Mobile branded devices are available at more than 40,000 retail stores, including Target, Walmart, Best Buy and RadioShack. Top-Up cards are available at approximately 150,000 locations nationwide and can be used for Assurance Wireless and Broadband2Go services. Purchase and experience Virgin Mobile on the Web and atFacebook, Twitter, YouTube and www.virginmobileusa.com. LG Electronics, Inc. (KSE: 066570.KS) is a global leader and technology innovator in consumer electronics, mobile communications and home appliances, employing more than 93,000 people working in more than 120 operations around the world. With 2010 global sales of 55.8 trillion Korean won (USD 48.2 billion), LG comprises four business units – Home Entertainment, Mobile Communications, Home Appliance, and Air Conditioning & Energy Solutions. LG is one of the world’s leading producers of flat panel TVs, mobile devices, air conditioners, washing machines, and refrigerators. LG has signed a long-term agreement to become both a Global Partner and a Technology Partner of Formula 1™. As part of this top-level association, LG acquires exclusive designations and marketing rights as the official consumer electronics, mobile phone and data processor of this global sporting event. For more information, please visit www.lg.com. The LG Electronics Mobile Communications Company is a leading global mobile communications and information company. With its cutting-edge technology and innovative design capabilities, LG creates handsets that provide an optimized mobile experience to customers around the world. LG is pursuing convergence technology and mobile computing products, while continuing its leadership role in mobile communication with stylish designs and smart technology. For more information, please visit http://www.lgmobilephones.com. 1 According to The NPD Group’s Mobile Phone Track consumer tracking service. WARREN, N.J. (BUSINESS WIRE), September 30, 2011 – Virgin Mobile USA strengthens its Android™-powered smartphone lineup with the upcoming availability of the HTC Wildfire S™ in Silver at Best Buy® and White at RadioShack® built for consumers looking to express their personal style without a contract. The HTC Wildfire Sin Silver is exclusive to Virgin Mobile. Social networkers and app users will enjoy the bright screen of the HTC Wildfire S and access to the Android Market. 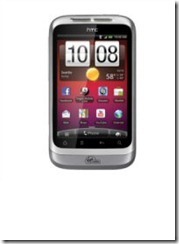 The HTC Wildfire S will be available Oct. 23 at Best Buy and RadioShack for $199.99. "The HTC Wildfire S is the first HTC smartphone on Virgin Mobile and we couldn’t be more thrilled to bring the Wildfire S™ to our customers," said Mark Lederman, Business Line director, Virgin Mobile USA. "It is an attractive, easy-to-use and fast smartphone perfect for both the technically savvy and those looking to make the leap to a smartphone for the first time." Martin Fichter, president of HTC Americas, said, "The HTC Wildfire S is a compact and playful smartphone offering a unique silver color exclusive to Virgin Mobile customers. HTC offers intuitive and powerful technology for the smart consumer and that perfectly aligns with Virgin Mobile." HTC Sense – HTC’s custom-built experience, which puts information most important front and center by providing further customizable widgets and applications. HTC Wildfire S comes preloaded with the Virgin Mobile Live 2.0 social networking lifestyle application used to access the Virgin Mobile branded music stream, hosted by DJ Abbey Braden. The app also provides users of Android-powered devices free access to live music performance videos and “check in” features at special events. All status updates made using the app will also sync with Facebook® and Twitter®.